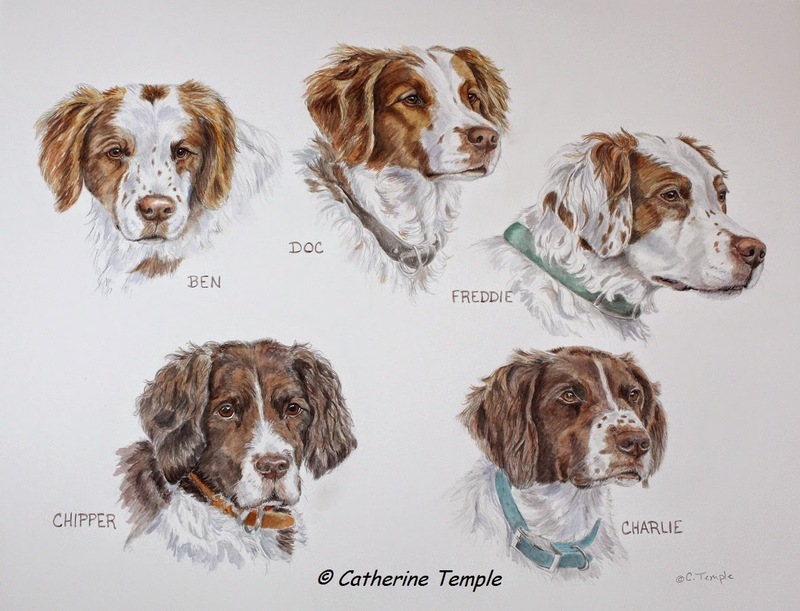 The Brittany portrait is now complete and has already gone to it's new home, but this has turned out to be a bittersweet commission. 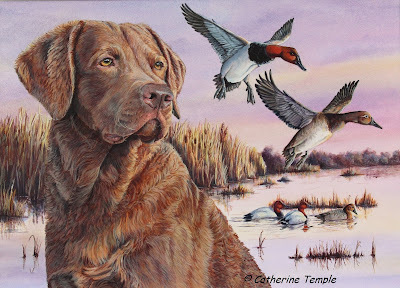 One of the reasons my clients wanted the portrait done is because it represented a lifetime with their dogs, filled with memories of great hunts, the challenges of raising pups and just the wonderful days together that always seem too short. Three of the dogs in the portrait had already gone when I started the piece and Chipper was getting up there in years and having some problems, which was another reason for the painting. Unfortunately, we lost Chipper just the other day and another good dog goes on to hunt other places without us until it's our turn to join them. I am always blessed by the opportunities that come my way to paint something so special and meaningful for other people. If I have done my job well it brings great pleasure to my clients and to me as well. When situations happen like the loss of a pet during the time that I was creating the painting it becomes even more than it was meant to be, touches both our lives in unexpected ways and, I believe, opens the door to healing a broken heart. Until next time.....may your days be filled with wet kisses, cold noses and wonderful memories. As you can see the portrait of the five Brittanies is coming along nicely. Every day I work on it I'm liking it more and more. Above is a detail from the portrait showing the initial pencil work and what it looks like with the watercolor wash. Though it doesn't show very well in the photo the pencil marks are still visible beneath the paint. This is especially evident in the areas of fur that are white. Using this technique is inspiring ideas for other paintings I'd like to try in the future. That happens quite often when I'm working on a piece. My mind gets into this creative zone that allows it to concentrate on the work I'm doing, yet wander off on other paths. I will often keep another sketch pad or notepad nearby that I will jot ideas on while I'm working. It's kind of a weird ability to have, but then I've never been accused of being normal! Well, I'm off to continue painting. Hopefully, I will have a finished portrait in a few more days! Brittany portrait in progress -14" x 18"
I recently received a request from a past client to do a portrait of their five Brittanies. I have been wanting to do a piece like this for these folks for some time because I know how much each and every dog has meant to them. Like myself, every pet owner I paint for loves their dogs to the depths of their heart and holds special memories there of each and every one. That's why a combined portrait of all of them can be so meaningful. This portrait is a little different in that I'm doing a fairly detailed pencil study of each dog. Over the top of the pencil I will be adding a light wash of watercolor. I use this technique when doing preliminary sketches for other media I may be working in, but it can stand on it's own as a finished piece quite beautifully. 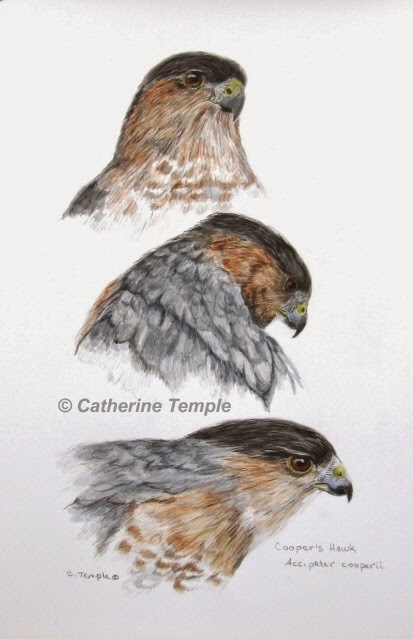 Here is an example of a Cooper's Hawk study using this technique. I rather like the understated simplicity of it. Hope you all enjoy this peek at a work in progress. I'm hoping to have it finished by next week and will post the final as soon as my client approves.